What separates a direct marketing partner from a vendor? In his recent article on how to reduce stress on your direct mail budget, Mike Ertel touched on one important nuance. He wrote that some companies accept the final design of a marketing campaign as is, just to “get it out.” The role of a vendor is to provide a particular product or service, no questions asked. Mike went on to describe how IWCO Direct engages with clients early in campaign development to avoid costly production issues and enhance the return on marketing investment (ROMI). This, on the other hand, is the role of a partner: to associate and participate actively in a business endeavor to reach a mutual end. Are they focused on my success? Do they provide me with the entire range of services necessary for me to be successful? Do they provide a process to analyze and improve on results? In short, you must decide if you want to hire a vendor that only does what they’re asked or a partner that is invested in making your campaigns (and your business) more successful. It is our philosophy that the choice, much like the difference, is clear. One thing we’ve learned is that our clients don’t “live to mail.” They “mail to live.” We always strive to be partners with our clients, fully invested in their success. This has meant reinventing ourselves over the years by maintaining a focus on client needs. This also means we’ve learned to ask questions to challenge the status quo – because sometimes the goals and challenges are clearly articulated and sometimes they are not. 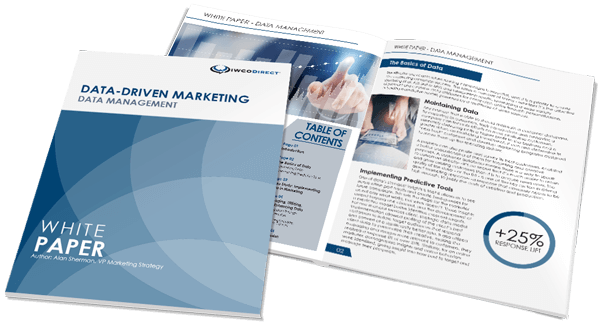 In order to become the best direct marketing partner we can be, we’re focused on providing our clients with a team of experts who clearly understand marketing’s requirements to create measurable results. We don’t try to sell a particular mail format. Instead, we delve deep into the needs of our client first, and then determine which channels best support their goals. We’ve also built a complete range of services unlike anything in the industry which combines Data, Strategy, Creative, Media, Production and Execution, and Analysis. Our process is based upon an integrated, Proprietary Intelligence model which includes an analytical process improvement loop, designed to constantly improve targeting, creative, response, CPA, and ROMI. By moving our focus from delivering mail related products to helping our clients gain the best return on their marketing channels, we have both moved upstream into a dialog with marketing decision makers as well as improved the make-up of the products and services we offer. There are many companies vying for your business. At the end of the day you want the company who partners with you to be focused on your needs while utilizing all marketing channels necessary to make your mail more successful. IWCO Direct is uniquely positioned to provide our customers unequaled access to moving the needle on return on marketing investment. After all, you don’t live to mail…you mail to live.